I always admire the work people in my community do for others. Like, Karen Martin, for instance. She’s been knitting knit hats for a state event for disabled children. Each year specific colors are selected, and knitters can combine them as they see fit. 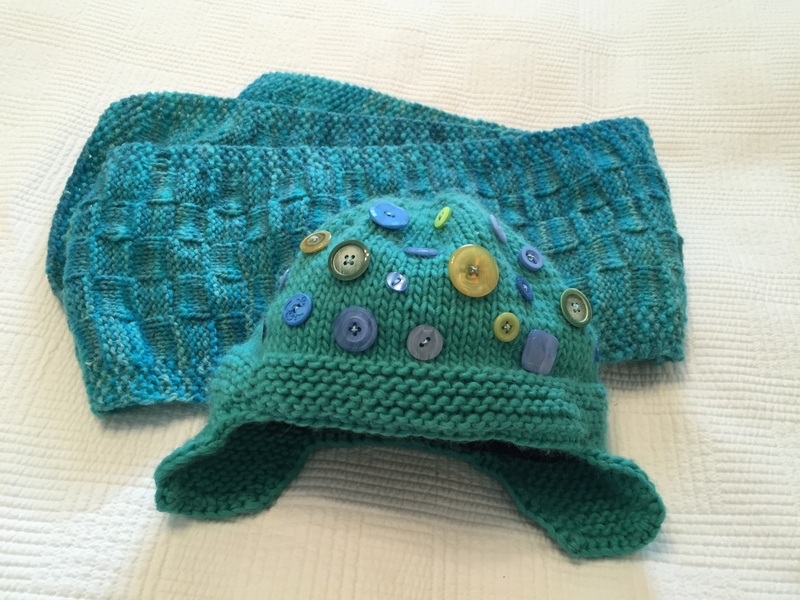 The hats with a yarn-color pattern will go to this event. Solid hats will be donated locally. Our library, for instance, has a Christmas tree every year where local matters hang hats, mittens, and scarves. I am always appreciative of and amazed with the number of donated winter hats, mittens, and scarves that our Maine local women make for our community children. There are TWO selvages on any width of fabric. One selvage can be colorful with round dots to show the different dyes, cool sayings, the name of the fabric, the name of the designer, and so forth. Indeed, fabric makers are getting quite creative with these selvages now as quilters are making all sorts of products using them, including dramatic and gorgeous quilts. When I first started quilting over 20 years ago, we were always cautioned NOT to use the selvage as the selvage was “different” than the fabric and would not handle or wash the same way. So, we just threw them away. The OTHER selvage is often plain, and for years I’ve thought about what might be done with those. I’ve tried knitting old t-shirt strips. They are ok, but a bit thick. I have a small rug upstairs made from t-shirt strips. It sits under the dog bowls. BUT, what about these OTHER selvages? I cleaned some up, which means getting the ripping threads under control, and looped enough together to make a long, continuous strand. Not bad. I got a big crochet hook and went around the edges with a single stitch just to refine it a big. This lone one is very cute on my dining room table actually. It needs some bright cloth napkins. Aqua maybe. Or, green. Or red. Whatever. But heaven knows I don’t need anymore rag rugs at the moment. You can see earlier posts about all the rag rugs made on a primitive Appalachian hand loom–using old sheets, fabric strips, etc. There are an astonishing number of selvages in this placemat. I just pin the whole project to the design wall, loop new selvages over one of the knitting needles, and when I get a hunk of them, I clean them up. loop them up, and spend some time knitting them into the work. But not Giovanna McCarthy. She just gets better and better and takes on more and more intricate patterns. Oh my goodness!! Giovanna’s work just blows me away. It’s been busy, busy here. Sister Susan came for a visit to see the fall leaves and me–the trees are still turning and are very late this year. But many were beautiful while Sue was here. While Sue was here, the old oven went out (the back door had to be removed and the old oven dismantled in the kitchen), and the new oven went in. Sue brought good luck: this stove event went flawlessly thanks to carpenter and friend Stephen Pennoyer (who came today to install the new stainless steel backsplash), the installation crew from Kelsey’s Appliance, and Linda McKinny, who cleaned where the old stove had been. The new stove came in with a half-inch leeway! We walked every day. The girl dogs were in doggie heaven. 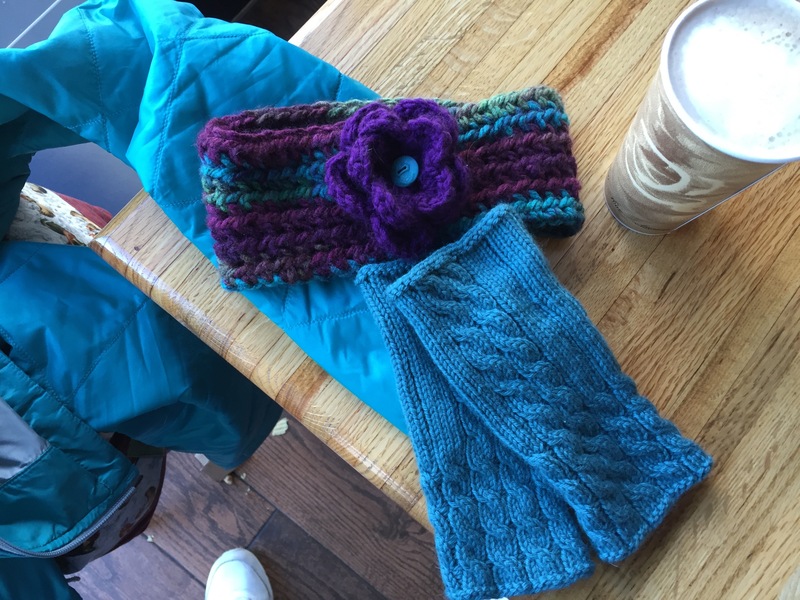 Don’t they go nicely with my new light LLBean coat and the winter hair band Bonnie Sinatro made for me last year. 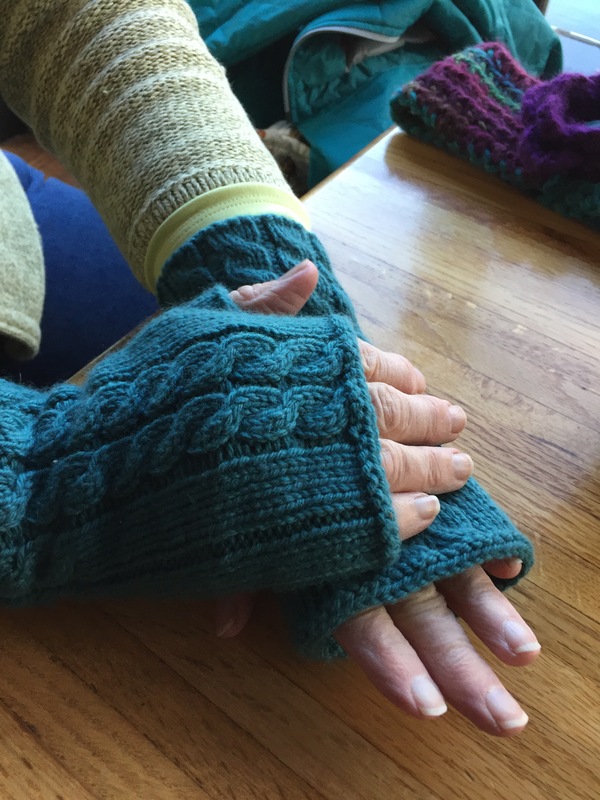 Mary Sue Bishop takes orders for the gloves and uses all sorts of wonderful yarns. 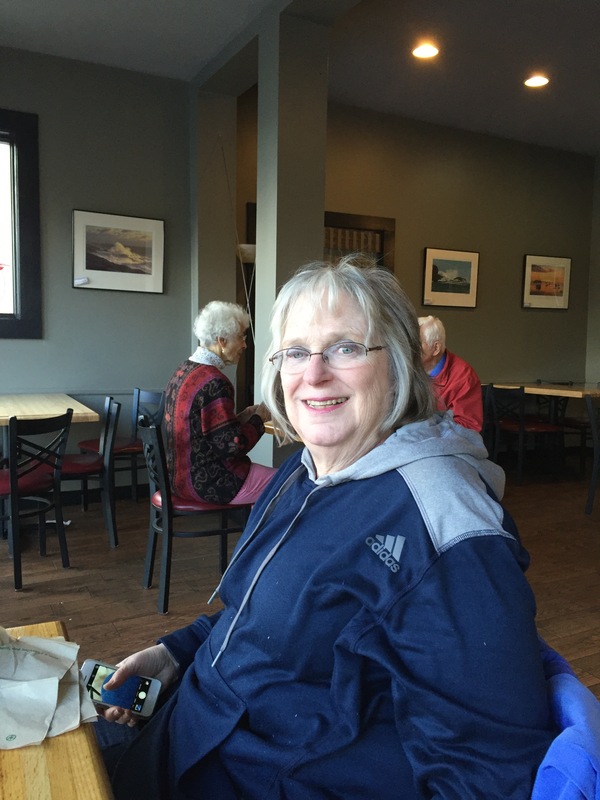 And Bonnie is a fellow Bellevue High School (Offutt AFB) 1963 classmate and terrific email friend. And here’s our view of the Camden Harbor at dusk. We’re at the point where the river comes under these buildings and spills in to the harbor. 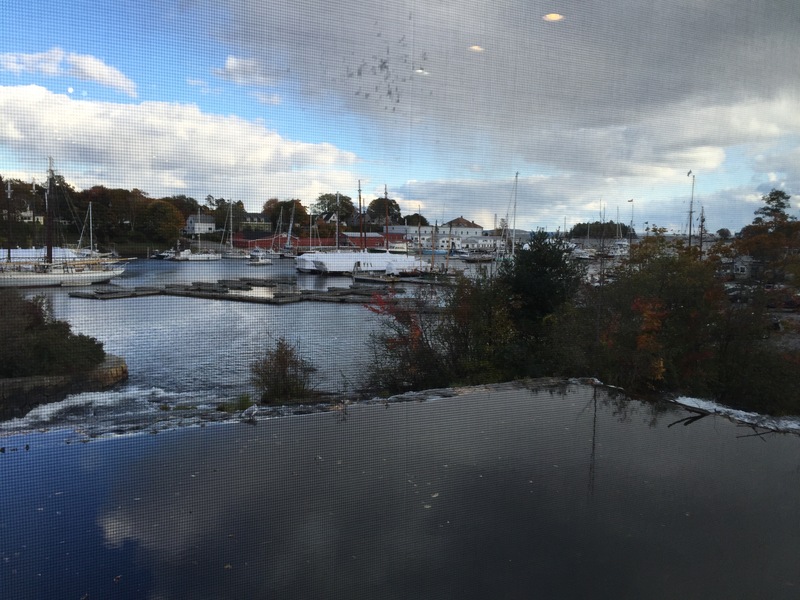 The windjammers are getting their plastic winter cocoons these days, and the harbor is slowly emptying out. The other night on the local news I heard that Portland, Maine, has had 6 feet and 1 inch of snow–that total has climbed as it snowed more on Wednesday and Thursday. Here in Camden, which is just under two hours further north, we’ve sometimes had more snow (much more) and sometimes a bit less. So, it’s pretty safe to say we’ve had at least 6 feet of snow this past winter–and most of it landed in the last three weeks. We’re all braced for the blizzard that will start tomorrow afternoon late. Predictions are for up to 24 or so inches of light, blowing snow. None of us has a clue about where we’ll put another two feet of snow. I’ve had a go-round with the electricity in the chicken coop, but that’s solved now. I have TWO lines going out there from different outside outlets. The water heater is working again. Our temps tonight are dropping to -14 degrees. That’s NOT wind chill. Or, that’s the prediction anyway. So getting electricity back to the chicken coop was really important. 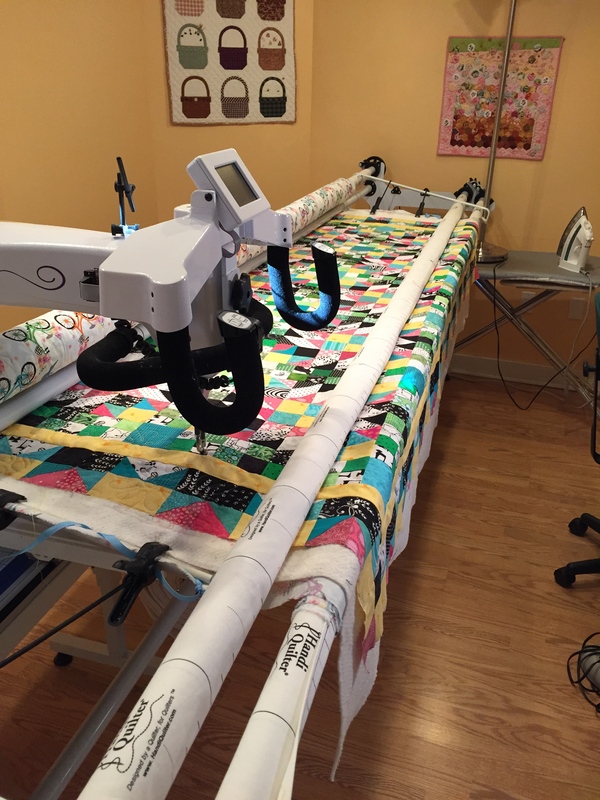 I have two more longarm passes on the Bonnie Hunter 2014 Mystery Quilt, Grand Illusion. So, I will be binding that quilt later today. It’s always so much fun to unwind a finished quilt and to see the whole of the quilting in it. 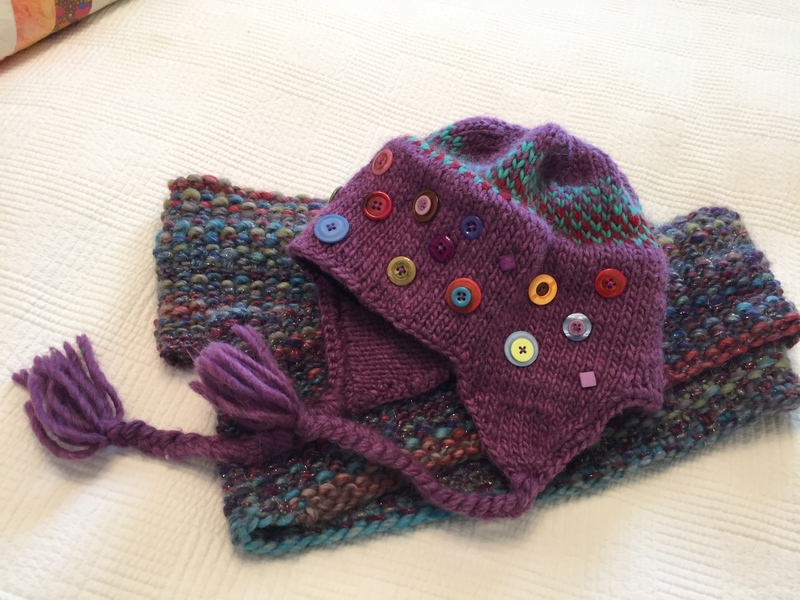 I finished two knitted wool hats last night–made to go with wool scarves I made last year. I went a little crazy with buttons. I put pics of this cowl (infinity scarf) up last year. There is a good match with the hat yarn in the lighter yarn in the scarf–it just isn’t showing in this picture. 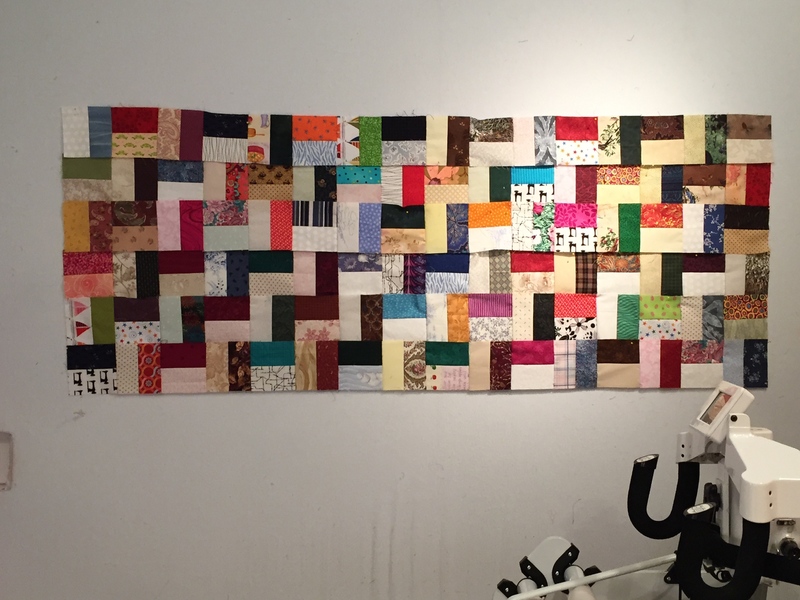 Here’s the quilt-in-progress on the design wall–a streak of lightening pattern. This fabric is the leftover from the other two scrappy quilts I recently made from my 2 1/2 strip bin. 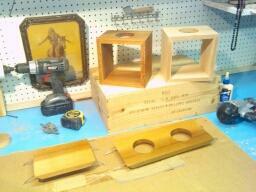 I was left with some shorter pieces, so I cut 2 1/2by 4 1/2-inch rectangles. I’ll use an inner border that’s about an 1 1/2 inches and put on a wider border of some sort–yet to be determined. This quilt will look very traditional when I’m finished. Simple and useful. This quilt will join its sisters in the downstairs tv/sitting room–replacing sturdy but ugly couch dog blankets. So far, so good in terms of looks and wear. It’s the best picture I could get in a series. The Pileated Woodpeckers are HUGE and very jittery and scary. He’s been around off and on all winter, but today he treated me to quite a show. 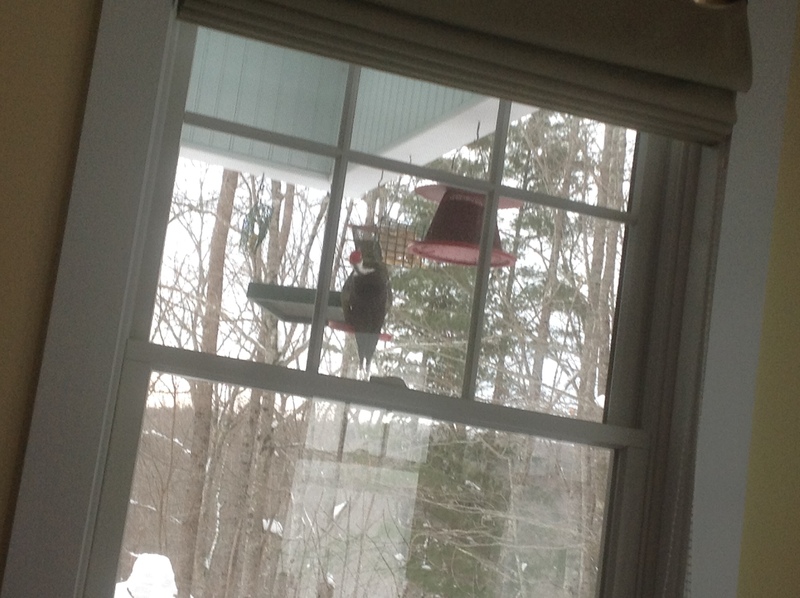 At one point he sat in the middle of the flat green feeder and just rocked himself back and forth. As long as I didn’t move a muscle, he stayed around. OK, bring on the blizzard. I’m ready.